Is Poddy a juvenile? I didn’t think of it as such and I suggest that it violates numerous taboos for the juvenile market. It seems to me that it is what the Swedes call a “cadet” book — upper teenage, plus such adults and juveniles as may enjoy it — and the American trade book market does not recognize such a category. Despite that, some people, including me, lump it in with his juveniles because the lead is a fifteen-year-old girl, with her eleven-year-old brother in an important supporting role. As I closed the cover of the last true Heinlein juvenile, I really wonder what this book would have looked like if in 1958 Heinlein had been able to envision and publish a juvenile with a female lead. We will never know the answer to that. We do have the answer to the question what would such a novel look like if Heinlein wrote it five years later and the answer is “horrible”. In the spirit of Social Credit leader Camil Samson’s wonderful phrase, “Ladies and gentlemen, the Union Nationale has brought you to the edge of the abyss. 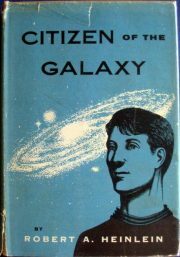 With Social Credit, you will take one step forward,” follow me over the edge and into the abyss that is Heinlein’s post-Scribners work. 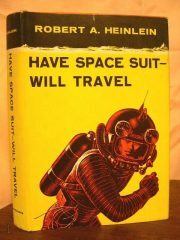 1958’s Have Space Suit — Will Travel brings us to the end of the Scribner Heinlein juveniles — universally recognized  as the only true Heinlein juveniles — and leaves us perched on the abyss that contains the Heinlein juveniles written without the firm hand of editor Alice Dalgliesh to moderate Heinlein’s various quirks (or alternatively, to insist he play to hers). 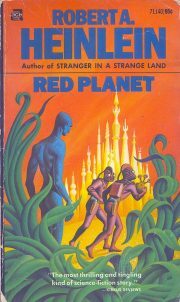 While it isn’t quite up to Citizen of the Galaxy, it’s an interesting example of how much Heinlein could milk out of a very straightforward plot. 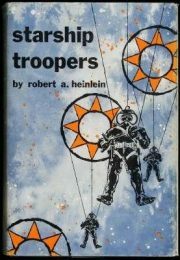 Some of this will come across as negative so I’d like to begin with “Citizen of the Galaxy is in many ways the most ambitious of the juveniles and it was that ambition that put Heinlein’s blind-spots out where I could see them.” This could easily have been a much more straightforward, much less interesting space adventure book. 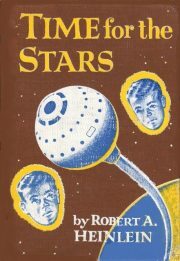 1956’s Time for the Stars feels like a regression for Heinlein, a book that if I did not know when it was published I would have said was one of the earlier juveniles. It’s also oddly downbeat, in that the protagonist’s most significant contribution to the world is something he could have done at home, something that makes his other efforts almost pointless. 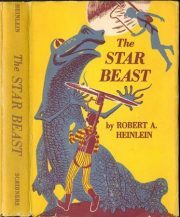 1954’s The Star Beast is notable for a couple of things. 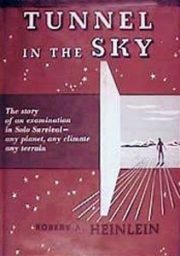 Of all the Heinlein Girls in Charge, The Star Beast’s Betty Sorenson is the girl most in charge and in Mr. Kiku we find an extremely uncommon figure for SF, a sympathetic career bureaucrat. 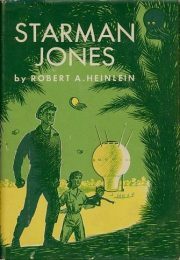 1953’s Starman Jones sees Heinlein abandon the Solar System (and plausible propulsion systems) for the wider galaxy. He also discards the idea of his protagonists coming from loving (if sometimes troubled) families and the quasi-utopian settings of some previous books, although he does not venture into the outright dystopia of Between Planets, the better to force his protagonist head-long into adventure. 1952’s The Rolling Stones is intriguing from any number of angles. 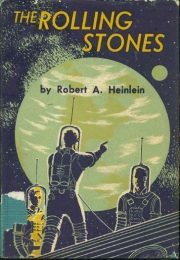 It’s the final Heinlein juvenile set entirely in the Solar System. It has genuinely interesting and potentially informative rocket science. 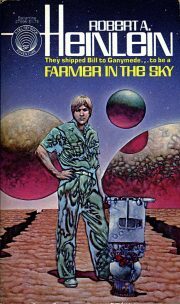 In contrast with several of the earlier books the stakes, while important to the characters, are comparatively low. The sexual politics are tragic in a way I can talk about. My discussion about the two leads will starkly illuminate how poorly I manage to keep current affairs separated in my head from whatever I happen to be reading. It’s all good! 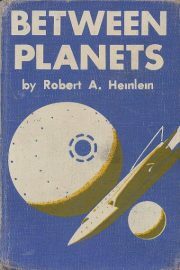 1951’s Between Planets continues the evolution in Heinlein’s fiction of Earth’s government away from the optimistic portrayal in Rocket Ship Galileo. This Federation is overtly oppressive, and while the atomic bombs of Circum Terra keep any terrestrial nation from rising up, there is no such brake on the colonists of Venus. 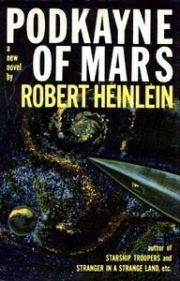 I think Heinlein worked on his technique all through the juveniles but to my eye 1950’s Farmer in the Sky, while introducing themes that would persist through the rest of his career, is a half step back, filled with pacing issues and the decision to highlight aspects of his world-building that he probably should have tried very hard to distract people from. Post-war but not too post-war America! 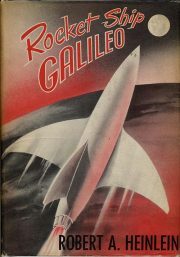 While the UN police guarantee global peace and systems as different as the American and Russian ways of life live together amicably, three young men, products of America’s impressive new school system, are focused (as so many young men of this time were) on their homemade rocket. 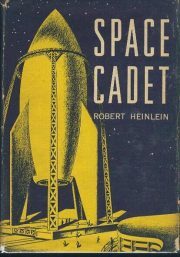 While the rocket itself goes all kerblooie, the young men - Ross Jenkins, Art Mueller and Maurice Abrams – count the experiment as a success, at least until they find the unconscious man on the doorstep of their test facility, apparently brained by a fragment from the exploding rocket.